For the final project in this course, you will build a complete game using the C4 Game Engine from Terathon Software. IMGD-3000 focuses on the technical aspects of game development, and IMGD-3500 focuses on the artistic aspects. Therefore, it is the duty of the 3000 students to make sure the result plays well with respect to the stated technical aspects, and of the 3500 students that it looks good with respect to the stated artistic goals you will outline. This project must be done in teams of four or five. Both the scope and compressed timeline (only six weeks!) of this project require that the project be done in teams. There will be several, rapid milestones to be met along the way to delivering your working product. These are listed below. Jan. 29 (Thu): Project kickoff meeting! In addition, see this list of other items. Feb. 14 (Sat): Begin internal testing of implemented parts. Build, build, build! Mar. 02 (Mon): Milestone 4: "Feature-complete" game, all major functionality in place. No new ideas! Time to finish up and test, test, test! Mar. 04 (Wed): Game complete. Go home and get some sleep before launch day. We were fortunate to have four "judges" from the game development community come to the final presentations, and rate the performance of the groups on various criteria. The judges were Cardell Kerr, Creative Director, Turbine, Inc., Ichiro Lambe, President, Dejobaan Games, Jesse Smith, Designer, 38 Studios, Brian Sullivan, President, Iron Lore Entertainment. The judges played the role of Publishers, evaluating each team's presentation, and distributed funding at their own discrection (okay, so there wasn't any real money, but maybe someday someone will sponsor this event!). Students also rated each other's games, and voted for the best in each category. Keep in mind that the teams only had about 6 weeks to go from idea to prototype. 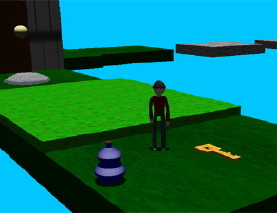 This is a first person platformer game that revolves around solving puzzles through assembling tools. The player is spawned in a world and given a destination. In the world with the player are a number of useful items that he can pick up and carry. 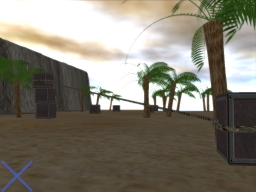 When the player meets and obstacle, such as a large gap, the player will need to combine the items he has to build something that will get him over the gap, like a rope bridge. 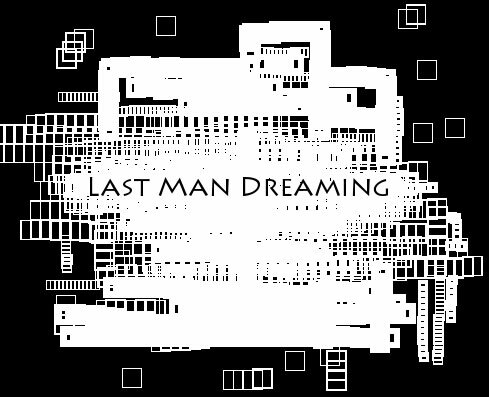 Last Man Dreaming is a slightly mature party game that is made up of several mini-games. A madman has trapped the players in a dream world (a nightmare for the players), and forces them to complete his challenges. Ultimately, the goal is to survive these challenges. A life-or-death game of tag for keeps. The hunter is fast, deadly, can sprint and lunge--the prey is agile, has a 3rd-person view, and must use the terrain to survive. The hunter chases the prey, until the hunter runs out of energy. After consumption, the roles switch. Hopefully this will run. In this game, the player assumes the role of an average person beset on all sides by hordes of every imaginable type. Zombies, girl scouts, religious fanatics, door-to-door salesmen and more launch an assault on the player, who doesn't have access to the kinds of weapons that the typical action hero uses to battle off such creatures. 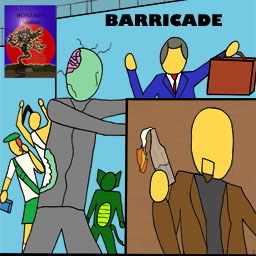 Instead, the player must make use of common items in the environment to barricade the entrances, keeping the hordes out until help arrives to be rid of them. 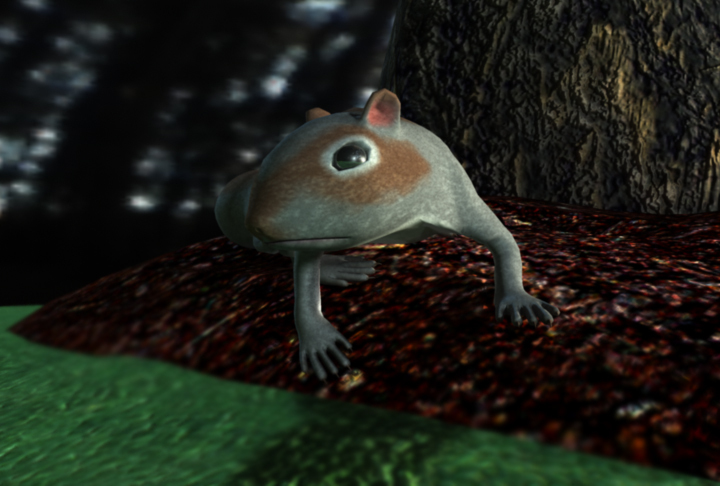 As the game progresses, the different types of enemies will arrive, with different skills to circumvent the player's obstacles. 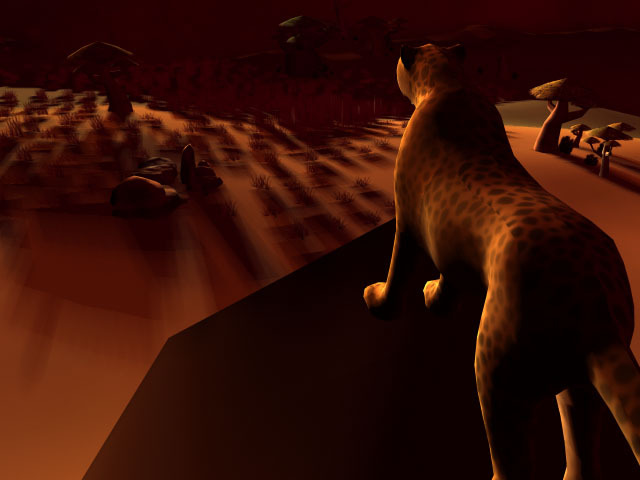 While barriers are the easiest to erect, the player can also gather components to build traps to kill off some of the attackers, although traps are far more intricate and the pieces are far less common. Minimus Maximus (MM) is a flying squirrel that can change between three sizes: a normal sized squirrel, a man-sized squirrel, and the size of a bug. Using this talent, MM must solve a variety of puzzles inside a giant tree, some components of which require a specific size to finish. 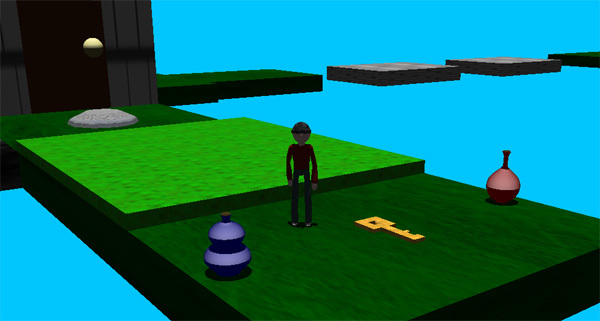 Solving a puzzle opens access to more areas, each of which contains additional puzzles, but to reach the new areas, MM must first navigate there. The goal of the game is to help MM reach the final area, which contains the Quantum Acorn of Ambiguity. 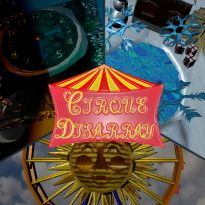 This is a multi-genre game where you are capable of switching to a different genre at certain points to solve puzzles and move the game along. Your interactions affect the game's story and some scenarios require you to level up your character before you can advance (e.g., you need to reach the top of a ledge, but by leveling up your character's jumping skill you can go into platformer mode and jump up to the ledge). Cirque Disarray is a survival game in which a player is thrown into several random 3D rooms. Each room contains a different mini-game. 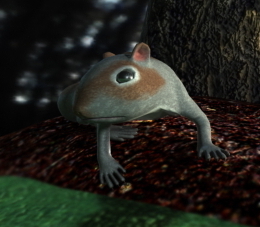 In each of the mini-games the player must perform a simple act/task (jump, move, avoid, etc.) in order to pass; else he or she fails that game. If the player fails a mini-game then that mini-game is removed from the compiled mini-game list. Once a player fails all the mini-games he or she will lose the game. As the game progresses the mini-games get faster and harder. Players will be scored depending on how long he or she stays alive. "Feel the Paint" is an unique version of a first-person shooter. You play as an artist trying to add color to the bland city of Monotown. Your weapons are a paintgun and a paintbrush. You start out with only 10% of Monotown painted, and your final goal is to paint 100% of the city. Buildings have targets which, when hit with a paint stream, cause the corresponding portion of the building to be painted. Small-level enemies act as a nuisance as they try to steal your paint, undo your artwork, or diminish your health. As you reach milestone percentages in the progress of painting Monotown, you are presented with boss battles. These bosses are buildings and monuments that can move and involve a small puzzle to be defeated. As you beat boss buildings, you discover new portions of the city and are allowed to continue painting. 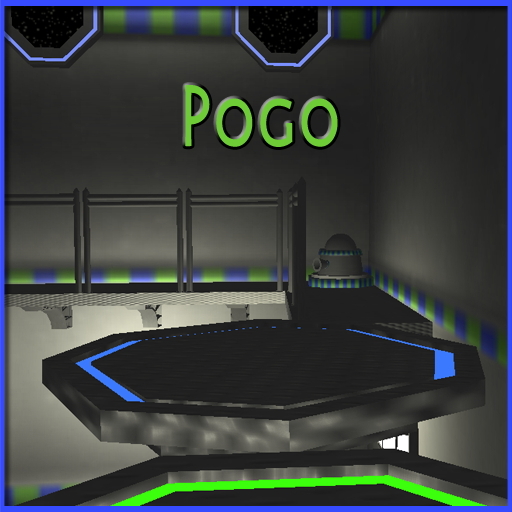 In Pogo, you play as a spaceman who has been abducted by aliens. 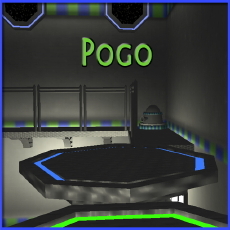 With nothing but your trusty pogo stick, you must escape the alien prison. 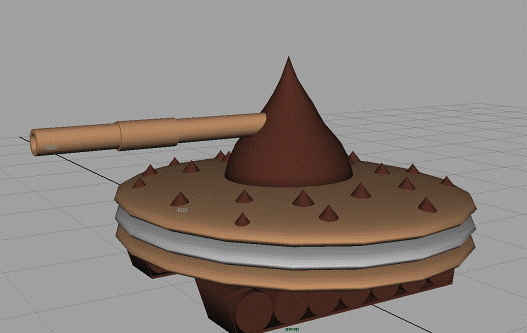 Dodging enemy turrets and navigating the fully three-dimensional levels, you platform to safety. In order to make sure you gain experience with modern development and team-based tools, you must use WPI's SourceForge for this project. Each team should, therefore, create a new project, and add all the team members, in addition to both instructors and TAs, as administrators. You must create adequate documentation, both internal and external, along with your assignment. The best way to produce internal documentation is by including inline comments. The preferred way to do this is to write the comments as you code. Get in the habit of writing comments as you type in your code. A good rule of thumb is that all code that does something non-trivial should have comments describing what you are doing. This is as much for others who might have to maintain your code, as for you (imagine you have to go back and maintain code you have not looked at for six months -- this WILL happen to you in the future!). Create external documentation for your program and submit it along with the project. The documentation does not have to be unnecessarily long, but should explain briefly what each part of your program does, and how your filenames tie in. NOTE: For this project, you must also include a document stating what each person on your team did towards completing the project. This can be as simple as a list of deliverables, placing names next to each one. Or it can be more precise. If you feel you would like to express your views individually, send an email to the instructors. Place this file in your SourceForge space, and label it as such. Remember the policy on Academic Honesty: You may discuss the assignment with others, but you are to do your own work. The official WPI statement for Academic Honesty can be accessed HERE.